Welcome to the JVNP 2.0 Update featuring a primary JV invite courtesy of fellow JVNP 2.0 Partner Adeel Chowdhry (Sqribble pro eBook and report creation software launch affiliate program JV invite), Buzz Builders (Matt Clark + Jason Katzenback – Amazing Selling Machine 10 (ASMX) launch), and More … in Today’s have we got Adeel for you edition. Hey, Fellow JVNP 2.0 Partner … it’s Adeel Chowdhry here with a very special JV & affiliate announcement! If you don’t already know me I’ve got numerous #1 best sellers and multiple 7-figure launches under my belt over the last 10 years. This time I’ve got something bigger! 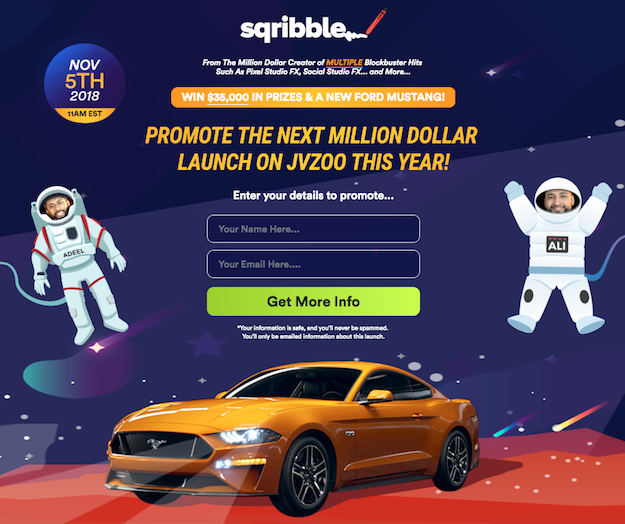 I know what it takes to orchestrate a winning million dollar launch so that’s why I’d like to invite you to promote Sqribble, which could make you an easy 5 figures in commissions! I’m giving away $35,000 in prizes and the 1st place prize is a new Ford Mustang or $20,000 in cash! There are NO minimum sales required either. You get 50% commissions on every product in the funnel and bag up to $450 per sale. I’ve spent over $50,000 on high quality marketing components (i.e. videos, graphics, copy) and have done all the work for you. There are TONS of email swipes, banners, demo videos, review articles, graphics, tutorials, tweets, bonuses and more, to make sure it’s the best promotion for you this year with very little effort! Wait until you see the JV video! (It’s out of this world, literally!). Many Top PD Affiliates are On-board for this Launch … Don’t Miss Out! Earn 50% Recurring Affiliate Commissions on Every Sale – For Life! Spin Rewriter is the best selling product in this multi-million dollar market. Our sales funnel guarantees amazing EPCs and conversion figures. Professional swipe emails, banners, videos and bonuses are all available. We know what we’re doing – our previous launch of Spin Rewriter brought in over $250K in less than a week … and you will make 50% recurring affiliate commissions on every sale – for life! Mind Movies, Eben Pagan, John Di Lemme, and other fellow JVNotifyPro 2.0 partners are waiting in the wings … keep your eyes on your Inbox, and follow the action in the JVNP 2.0 Premium VIP JV Announcement archives.